I finally decided to build a worm bin and i thought id share my new hobby. I was told that is quite easy to do and from what i have learned, it pretty much is. Its built out of a old rubbermaid i had sitting in my garage. All i had to do was drill some holes on the sides and that was it. 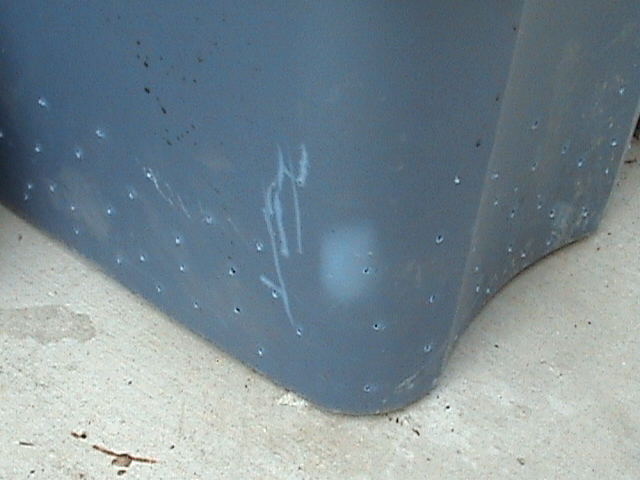 The holes are to help aerate the bin and prevent excessive water from drowning my worms. I built the worm bedding very similar to the way it was done in the video (link provided above). 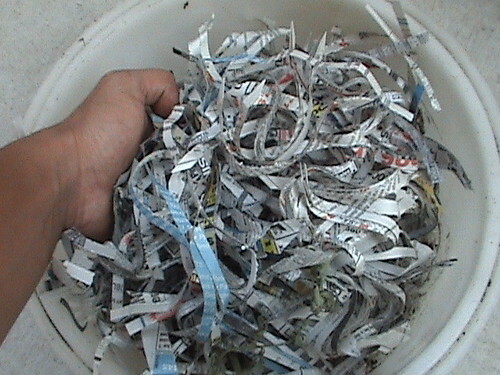 I shredded some paper, mixed that with some finished compost, peat moss and soil less potting soil. 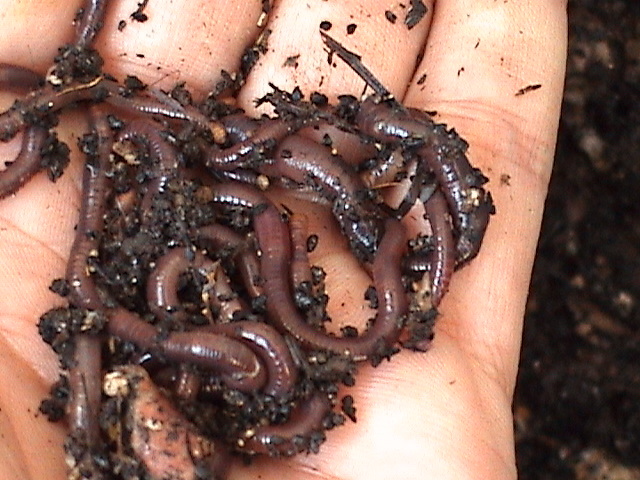 I then added some worms that I collected from my garden soil, but also added some red wigglers i got at OSH. There were supposedly 200 worms, but from a glance i could only see maybe 20 or less. After adding the worms I then added some unfinished compost, coffee grounds, crushed egg shells, corn meal, bread crumbs and freshly chopped up food scraps, fennel, marigold, and basils. That was it, i lightly watered the bin down with freshly brewed compost tea and covered the bin with a moist rag and the rubber maid cover. total price was 10$, that was spent only on the red wigglers.. I checked it every other day and after a week I noticed a few worms have grown in size. In my excitement i thought what the heck, ill add more worms. Again i went to OSH and got me another bucket of 200 worms..
After covering up the new worms a bit, i decided to add another layer of shredded paper. 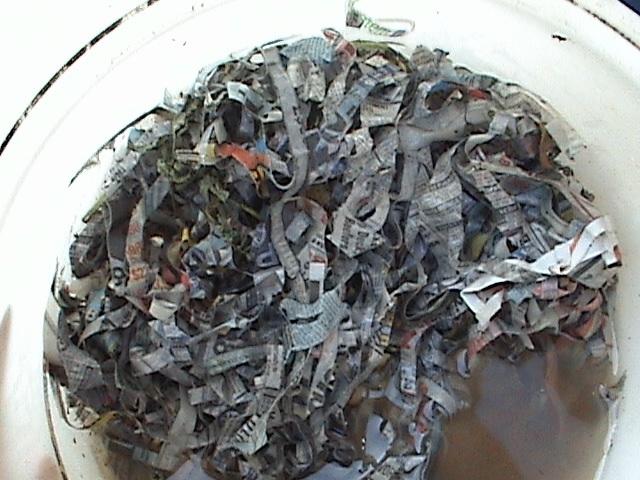 I believe worms like moist paper so i soak my paper in fresh brewing compost tea, like i do when adding to compost. After i added the paper bedding i decided to add some soil amendments i have lying around. These amendments are sure to feed the worms, and other micro organisms in my bin. dolomite lime was added in a very small amount for the cal/mag it contains and to help with ph buffering. Worms i think can handle a peat based ph but the cal/mag was a good choice IMO. Kelp meal was added because it has plenty of minerals and trace elements, growth hormones, vitamins, enzymes, and proteins that im sure are good for any compost. Finally fish meal was added for trace elements and for the nice NPK value of 9-4-1. 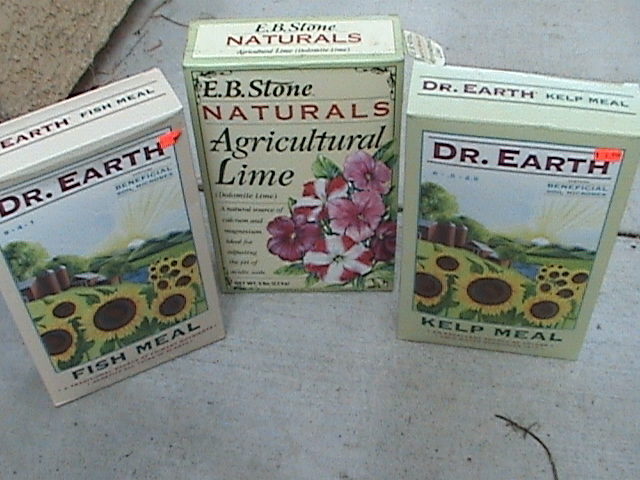 Also the kelp and fish meal were products of dr. earth, these soil amendments also contain beneficial microorganism to help inoculant the worm bin or soil. I only added about 3-4 TBSP of each, since i am not experienced with worm farming. IMO Less is best! 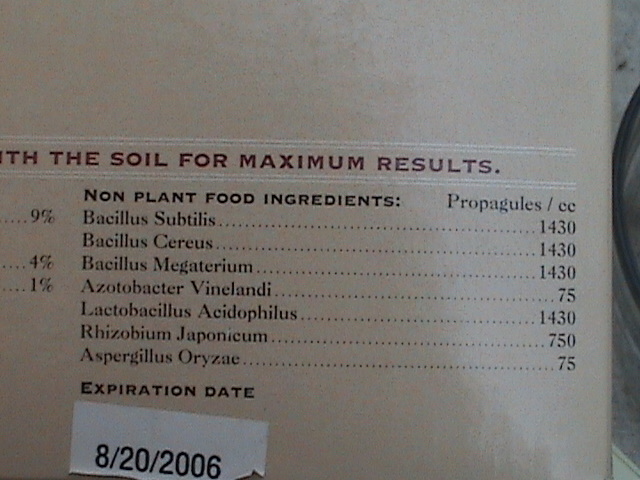 Once the amendments were added i grabbed a container filled with home made soilless potting soil and some food scraps. 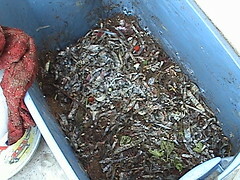 the food scraps(worm food) was made up of tomatoes, onions, coffee grounds, and chopped up fennel leafs and roots. My goal is make the worms comfortable enough to breed and help build the micro herd to decompose the food faster. If any one reading this has any experience with worm farming or any thing to add, i would love to hear any tips, opinions, or links to further help improve my vermicomposting hobby. I've heard they love banana peels. I'm thinking of starting one soon as well, so I can fish for free. Great pictures! It looks good. I wonder about the moist cloth though. Can they breathe? 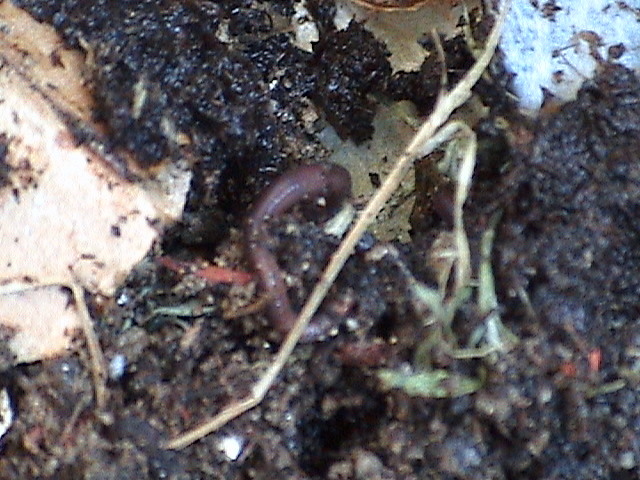 I have many natural red worms and earthworms at the bottom of my compost pile near a piece of wood. There must be something the red worms like about the wood. 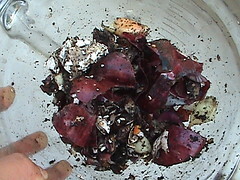 The compost near the red worms is much darker than the rest. Looks fantastic!! Thanks for sharing your set-up. I'm sure you have some happy worms on your hands now! thanks for the kind replies, this is really easy and id recommend those who are interested to give it a try..EWC is really really good stuff. a0c8c wrote: I've heard they love banana peels. Diane wrote: It looks good. I wonder about the moist cloth though. Can they breathe? Im sure they can breathe, lots of holes and shredded paper.The moist cloth was recommended by a near by vermicomposter, that i use to get EWC from. She told me the cloth will help them breed?? she explained that they like to lay there eggs/cocoons on it..So why not..but ill take your advice and not cover the whole pile, just half..
Diane wrote: There must be something the red worms like about the wood. not bashing you at all. But I am wondering why do people have worm bins. I have always added stuff like you put in your bin to my garden. At my last house (2 years ago) I had an incredible amount of worms, really INCREDIBLE amounts. They were all natural, I never added a single worm they just appeared. This is after tilling my garden twice a year at least as well. I have noticed an increase in the worm population in my new garden, which was half clay half rock before I got to it. Am I missing something. Again sorry if I sound ignorant as in mean, I'm more like ignorant as in not knowing all the facts. gixxerific wrote: not bashing you at all. But I am wondering why do people have worm bins. I have always added stuff like you put in your bin to my garden. At my last house (2 years ago) I had an incredible amount of worms, really INCREDIBLE amounts. They were all natural, I never added a single worm they just appeared. This is after tilling my garden twice a year at least as well. 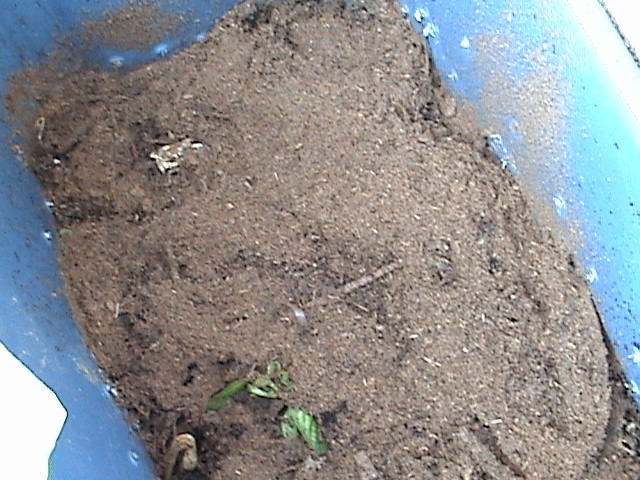 the worm bin is used to help me compost material. 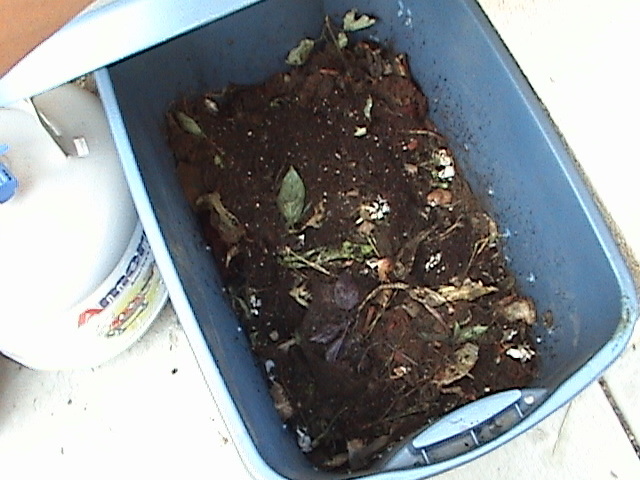 My compost bin works great but i needed another and the worms were my choice. the stuff i add to my bin will help the microbes in the bin, these microbes are in garden soil too but by adding any form of compost to soil we increase ther numbers. 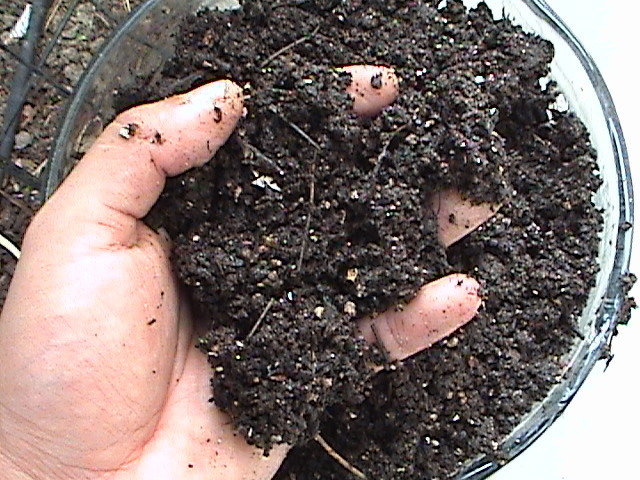 Unlike other compost, vermicompost also contain worm mucus which helps prevent nutrients from washing away when watering and helps soil holds moisture better . 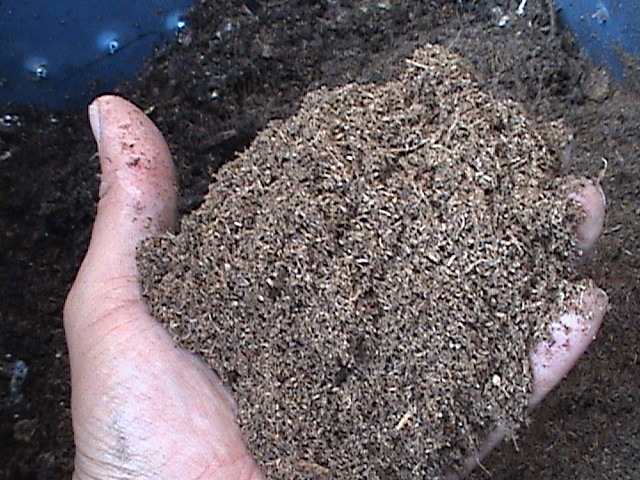 Vermicompost has also been shown to be richer in many nutrients than compost produced by other composting methods. 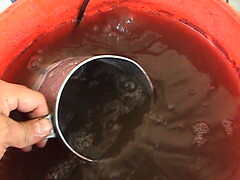 I am also a compost tea brewer, to me freshly harvest vermicompost will definitely help my brewing. 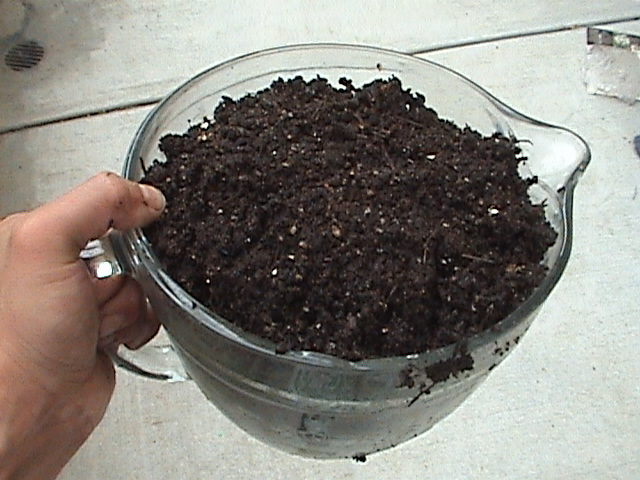 Vermicompost is also a stand alone organic fertilizer, you can easily mix this with water and feed your plants. 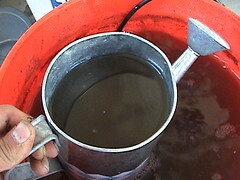 worm casting tea is such a great product that many organic liquid fertilizer use it as an ingredient. Ther is a product by terracycle, that is simply worm pooh and water. Im not adding these worms to my soil, im using there pooh. Pooh that is made by what normally gets hauled away to a landfill. 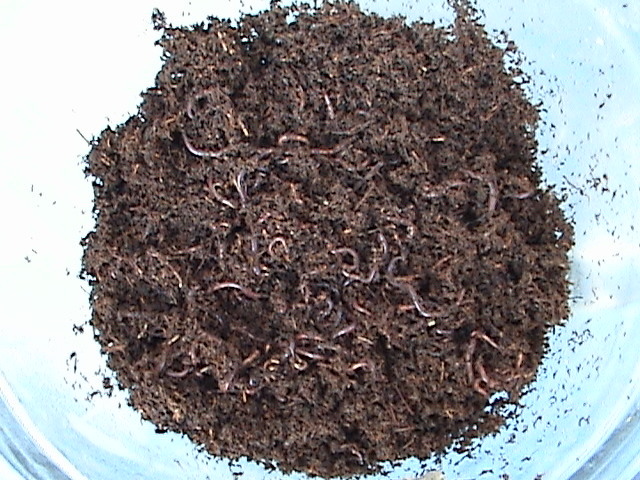 Since I have so many of these worms in my compost I find it difficult to remove them when I screen the compost. I hand shovel the compost on the screen and then flick back the worms I find, but there are always some hiding in there. Ah, I see thanks. Sorry i don't know what I thinking. so it's more of a composting tool than a worm factory. 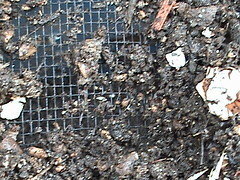 Diane wrote: Since I have so many of these worms in my compost I find it difficult to remove them when I screen the compost. This is my first time vermicomposting, i have yet to harvest the goods. I planed on screening, like you mentioned. I was going to use a 1/3 ich square mesh, over a 5 gal bucket?? gixxerific wrote: Ah, I see thanks. Sorry i don't know what I thinking. so it's more of a composting tool than a worm factory. No need to be sorry, asking questions on why i do things isent ignorant in my book , Im hoping it can be both (compost tool,worm factory), i want my worms to breed. When i get enough ill be adding worms to my compost and go fishing! never fear top_dollar they will breed, breed like rabbits. I have a bunch in my 2 yr old garden. At my last house\garden which was about 10 years in the making there were millions of worms. Big ones too my boss would come by and get them for fishing, has a big lake on his property. Yes I had ton's of worms even with tilling year after year (sorry Applestar) they didn't all get cut up. Can't remember but they reproduce very fast like 10-+ young ones every month or so. :Edit: Here is a quote from Uncle Jim's Worm Farm "Talk about a return on an investment... once Full grown, Uncle Jim's Red Wrigglers lay capsules every 30 days. Each capsule contains six or seven "Baby Worms." With proper care (Feeding, Watering & Bedding), the results are awesome!" Good luck, maybe we could trade some worms or something. When I screen, I use a plant holder you get when you buy lots of plants over a pot. 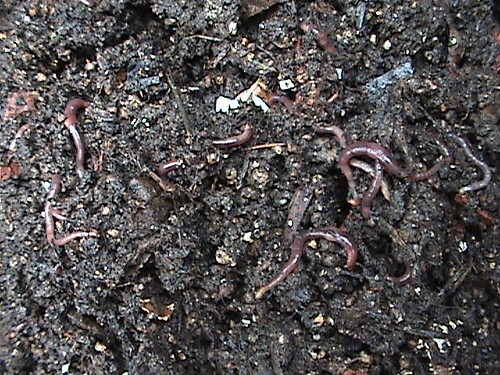 Some of the red worms wiggle like crazy when they fall in and are easy to see and flick back into the compost. I check after every small shovelfull. I see more the closer to the bottom I get. I know I need a real screen....someday. 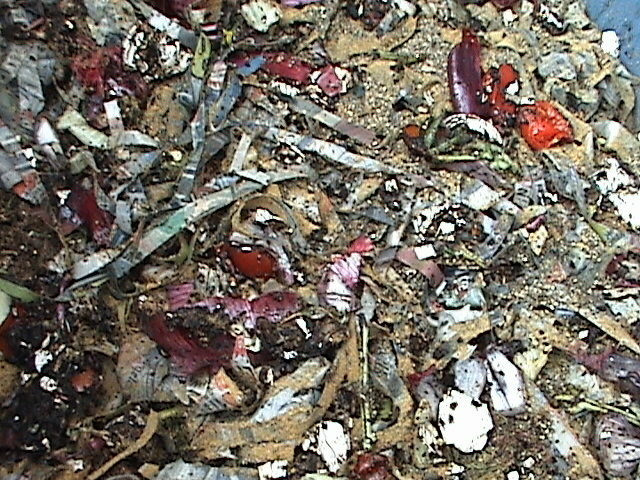 The compost is darker where they are. so now I convinced myself that I really need to try it this winter! top_dollar_bread wrote: This is my first time vermicomposting, i have yet to harvest the goods. I was going to use a 1/3 ich square mesh, over a 5 gal bucket?? ! just harvested some casting, got a nice look at the worms and boy oh boy did they grow..i have yet to see any cocoons, none on the wet rag but i have seen tiny little babyworms. Im guessing ther breeding but intill i see cocoons for my self i cant confirm!! I used the screen method i mentioned earlier and the end product was priceless. I decided not to collect the goods in the 5 gal bucket, instead i used the bucket to hold the material that wouldnt fit threw my mesh screen. 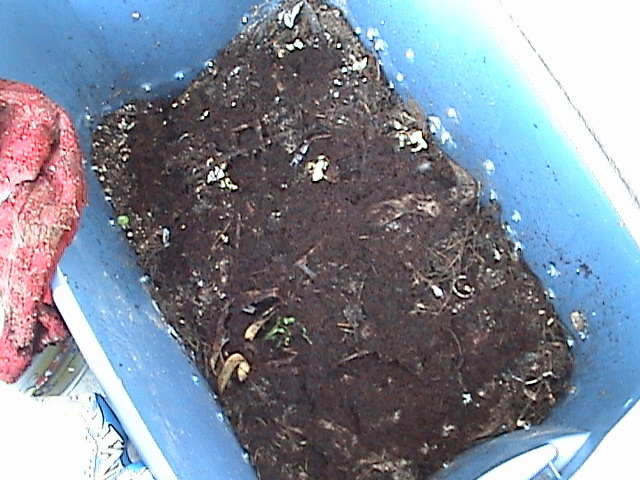 First i moved all the vermicompost to one side of the bin. 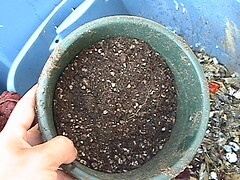 I wanted to collect the sifted finish compost on one side (empty side) and use the vermicompost on the other side to sift. 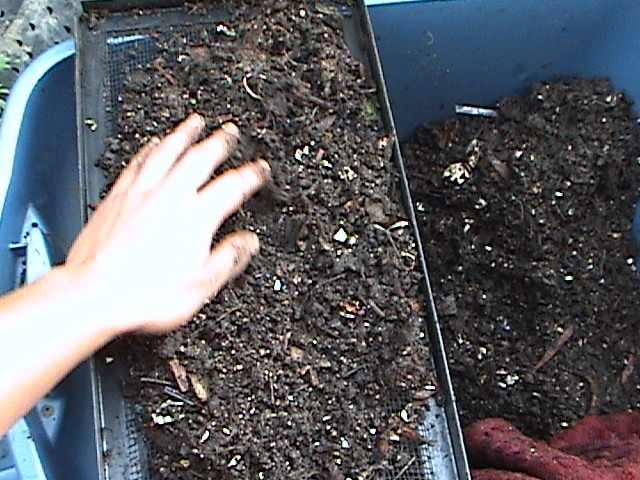 I placed the vermicompost on the the screen and used my hand to genly sift the vermicompost threw the screen. 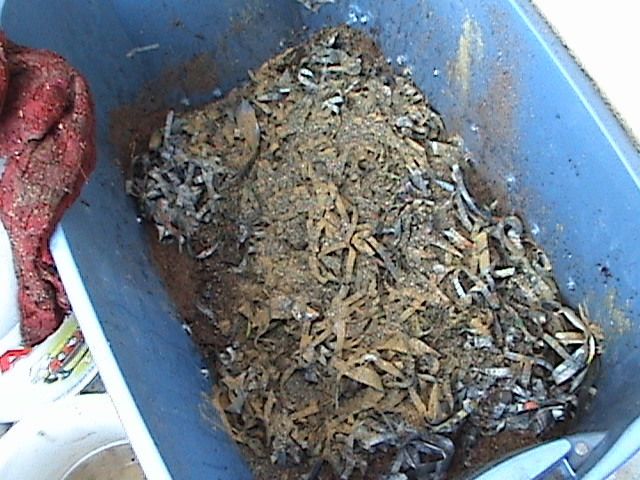 Worms don't like the light and many run to the bottom of the bin. The ones that don't either get hand removed or wiggle there way threw the screen. 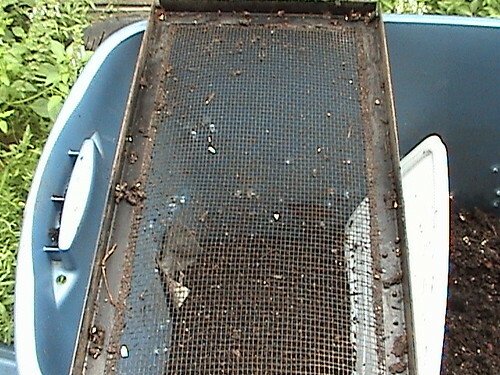 the screen collects uncomposted material and chunks on the top, and fine finished vermicompost falls threw the mesh to the part of the bin i divided for harvesting. Even when the organic material isnt done composting yet, no bad order!! this is my 1st crack at vermicomposting and im hooked, really enjoy this and the worms eat like mad. I have been adding material every week to every other day..but not in mass amounts!! 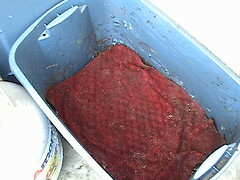 The wet rag really helps bringing worms to the surface and after every time i opened the bin and remove the rag. I see about 20 or more worms kicking it, till they realize ther not under the rag, see the light and wiggle ther way into the heap! The wood was a good add too thanks Diane the worms seem to huddle around the wood chunks, looks like ther all mating in one big pile but im no expert..
Thanx for stopping by, indeed the wormbin is good for indoor composting. 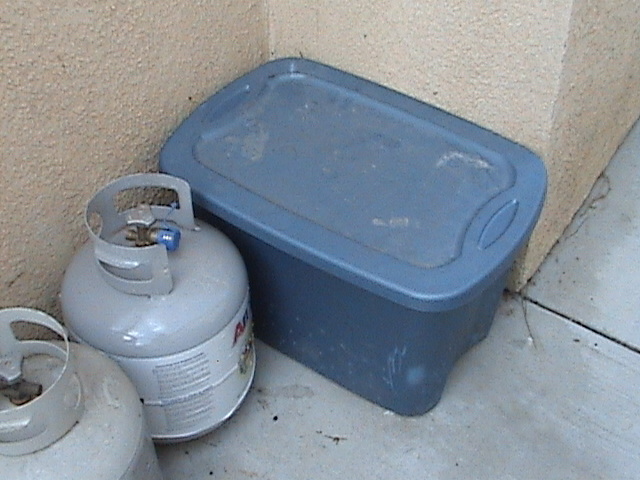 It doesnt smell bad at all.I have mine outside but thats because i live in cali and its been 100+ for the last few days. It hasnt rain since spring and its just been HOT!. thanks for the link, i will be making fresh EWC tea with the goods!! about to check out the ACT thread, hope your enjoying your tea's!